Guante raps. 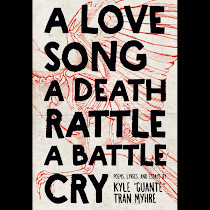 Guante is not "a poet who raps." Guante raps really well. Guante also performs spoken-word really well, but for him, those two things aren't related all that much. It is possible for one person to do two (or more) different things at a high level. When you speak to Guante, he is very calm, his words leave softly - introspective; then his raps explode through your space. dooooooo i knew guante could rap! i wanna hear the new tunes. maybe i can spin something on my show?